IMBUS can help diagnose a small number of skin conditions and is the definitive method for identifying clubbing, a classic Internist clue. The majority of skin lesions should be imaged with a linear probe. However, a curvilinear probe may be needed in very obese patients. The gel and probe should not come in contact with potentially disrupted epidermis. Perhaps the easiest and safest way to deal with this situation is to apply an adherent dressing (Tegaderm) and then use the gel and probe on top of this. Alternatively, a more expensive option is a small IV solution bag (fresh out of its wrapping) placed over the lesion with the probe used on top of the bag. When a large area of skin is being surveyed, the IV bag may be better because it can be moved. For smaller lesions on hands or feet, a water bath is excellent with the probe never touching the body part. However, some probes can be dipped only part way into water. Thus, putting a large mound of gel over the lesion and placing the probe in the gel without touching the skin is an alternative. Many lesions should be examined with color Doppler to be sure about vascular malformations and proximity of important vessels. Patients frequently come to clinic with a recently noticed, or enlarging, lump in the skin. Most of these patients are worried about malignancy. 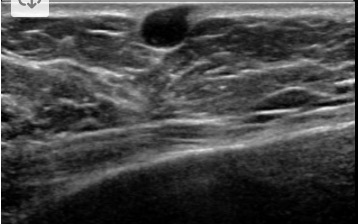 Unfortunately, even formal radiology ultrasound cannot reliably distinguish benign from malignant disease in solid skin lumps. As with lymph nodes, an important part of IMBUS for skin lumps is accurate sizing so that a follow-up exam can determine whether change has occurred over a short time period. Yet, some lumps have an appearance that makes benign disease highly likely, which can reassure patients. Find the greatest dimension of a lump and measure this as the “length” of the lesion. Then, obtain the perpendicular cross-section and measure the “width and depth” of the lesion. These dimensions may have no relation to the parasagittal/transverse orientations on the body. Consistency of measurement technique is important amongst examiners to enable accurate follow-up exams. Lipomas: These are the most common skin lumps and they can occur anywhere. Lipomas are solid, mobile, usually elliptical lesions that grow parallel to the skin surface and have minimal or no color power Doppler flow. Lipomas can grow slowly and become large. They rarely become malignant. They are most typically homogeneous and hyperechoic compared to adjacent muscle but isoechoic with adjacent subcutaneous fat. 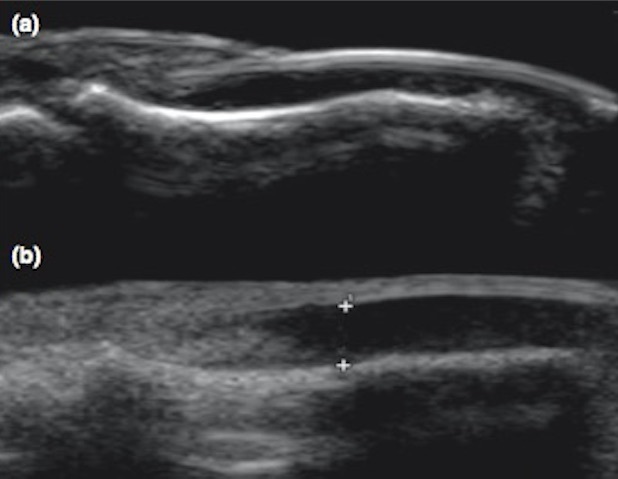 Perhaps most notable are the multiple, short, gently curved, echogenic lines in the lesion. One dimension may show these wavy lines more prominently than another so lumps need to be viewed in two dimensions. Lipomas should not have posterior acoustic enhancement or posterior shadowing. The following is a clip of a typical lipoma. The following mass was clinically thought to be a lipoma, but the IMBUS appearance was not a good fit and the color Doppler was active. This turned out to be a Schwannoma. Another clinic patient thought clinically to have a lipoma turned out to have a brachial artery aneurysm and color Doppler was critical to this identification. Epidermal inclusion cysts: These are common and contain a jelly-like substance which is a proliferation of squamous cells in the dermis or hypodermis. The term sebaceous cyst is incorrect because these do not originate in a sebaceous gland. These cysts are firm and non-tender until they rupture, when an inflammatory response can occur with the release of necrotic debris. They are most common on the scalp, face, neck, trunk, and back. It is rare for them to undergo malignant transformation. These cysts are well circumscribed and form in, or just deep, to the epidermis. It is typical to see a small neck, leading to the skin surface. When small, these cysts can appear anechoic, as in the following example. 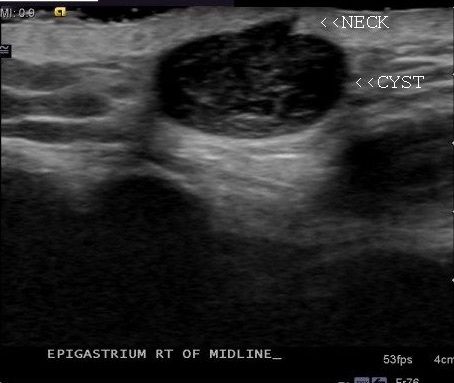 A small neck can be seen with this cyst. Larger epidermal inclusion cysts are usually hypoechoic and heterogeneous. Some posterior acoustic enhancement can be seen, as in the following example, which also has a neck. Ganglion cysts: These are non-malignant masses in close proximity to a joint space or tendon, often around the hand and wrist. Women are more commonly affected. Ganglion cysts are usually attached to a joint capsule or tendon sheath. With IMBUS, almost all are anechoic with well defined margins, unless the cyst has partially ruptured. There may be internal septations and posterior acoustic enhancement should be seen. A water bath is best to see these cysts on the dorsum of the hand/wrist but a large mound of gel with the probe not touching the skin will also work. The following example shows a ganglion cyst near the PIP joint of an index finger. Gouty tophi: These are not common lesions, but they are a classic Internist diagnosis. Tophi can occur in the skin on the ears or in various soft tissues, including close to joints. The calcium in the deposits creates hyperechoic lumps that are heterogeneous, sometimes called “cloudy”. A hypoechoic rim has been described around the deposits. The following is a typical, smaller tophus over a first MTP joint. The next example shows larger and multiple tophi over a wrist. There are other, more unusual causes of calcium deposits in the skin, but these are usually more dense and usually not very large (e.g. calcinosis and calciphylaxis). The following clip shows normal soft tissue in a leg, beginning with the superficial epidermis/dermis/hypodermis over a tendon, followed by muscle, and then the hyperechoic fascial line. The next still image shows a clinic patient with a very early cellulitis. The epidermis/dermis/hypodermis is modestly enlarged and there is some subtle anechoic fluid around some islands of tissue. Muscle tissue is visible at the bottom. Edema in the skin from any cause, including cellulitis, shows as anechoic fluid between islands of cells in an appearance that is called cobblestoning, shown prominently in the following clip. If a patient has cobblestoning of an arm or leg without overlying erythema or tenderness, the diagnosis of edema would usually be made. When erythema and pain accompany cobblestoning, the diagnosis would be cellulitis. However, a patient might have chronic edema from several causes and the question is whether there is complicating cellulitis. This is a more difficult diagnosis. Color power Doppler imaging is unfortunately not very helpful. The only distinguishing feature noted by some is increased hyperechogenicity of the cell islands in cases of cellulitis, compared to simple edema. In the example just above, the patient clinically had cellulitis and the cell islands are hyperechoic. Patients with clear cut edema or cellulitis need to be sought during the learning phase and imaged with consistent technique and machine settings so that the visual pattern of hyperechoic tissue of cellulitis can be learned. There are two reasons to routinely perform an IMBUS exam on patients with possible or presumed cellulitis. The first is to reduce the probability of necrotizing fasciitis, a feared type of cellulitis that needs urgent surgical debridement in addition to antibiotics. Necrotizing fasciitis is cellulitis plus gas in the soft tissue. Gas in the soft tissue shows as hyperechoic dots/blots, often with a dirty posterior shadow. The following clip shows a few patches of air on the left side of the screen. This second example shows the cellulitis at the top, with hyperechoic cell islands, but then the confluent patches of air, with dirty posterior shadows appear. The sensitivity of an IMBUS exam for gas in the soft tissue is not known precisely, but ultrasound is very good for seeing air and certainly the presence of air will ring an alarm bell. The second reason to do an IMBUS exam routinely for patients with cellulitis is to reduce the chance of missing an abscess. An abscess shows as a collection of fluid, almost always complex in nature, in or below the cellulitis. The following clip initially shows cellulitis but then a typical pocket of abscess is seen. Color power Doppler is not helpful for diagnosing the abscess, but may help identify any larger vessels in close proximity to the abscess that could get infected or might need to be avoided with any drainage procedure. About 1% of general internal medicine hospital patients were identified with clubbing using traditional visual methods (Vandemergel, Eur J Intern Med 2008) and about 40% of these patients had serious disease. Clubbing is a “pivot point” for diagnosis, because it has a relatively restricted number of possible causes. This differential diagnosis can then be reviewed to see what might fit with a particular patient. 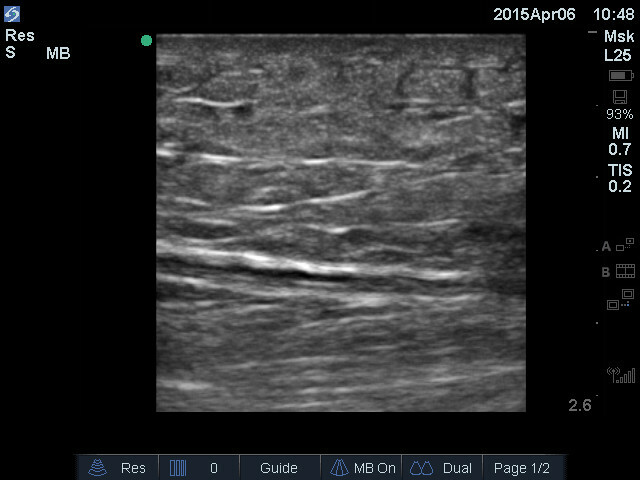 Ultrasound is superior to visual or tactile methods for assessing clubbing. Technique: Clubbing is caused by an increased growth and softening of the soft tissue under the proximal part of a nail. 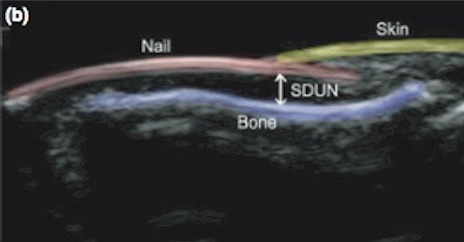 The following labeled ultrasound image shows the “soft tissue depth under the nail” (SDUN) that is the key to diagnosis. The angle between the nail and the skin, named by Lovibond, is normally ≤ 160 degrees. It is usually easy to tell when this angle has reached 180 degrees (horizontal) or greater. The index finger is used for the exam. Images can be obtained in a water bath or with a thick mound of gel over the distal digit. Orient the probe with the indicator towards the patient’s head. The following composite image shows a normal nail at the top and an abnormal nail on the bottom. The abnormal Lovibond angle was almost exactly 180 degrees in this example. This angle can be visually assessed or some machines can measure the angle. Notice that the SDUN is hypoechoic and can be measured. In a small series (Roy et al, Int J Derm 2013, 52: 1-5), normal SDUN was 0.16 ± 0.1 cm. In a group of patients highly likely to have clubbing, the SDUN was 0.284 ± 0.02. We can say that any width greater than 0.25 cm is suspicious for clubbing. Importantly, they reported that it was easy to see when the Lovibond angle became ≥ 180 degrees in all the clubbing patients. Thus, a quick measurement of the width of the SDUN and a visual assessment of Lovibond angle is all that is needed to assess the strength of evidence for clubbing.